For those wanting younger looking hair with radiant colour, Clairol Nice'n Easy Age Defy's three-step system gives you up to 100% long-lasting grey coverage and fights the seven signs of aging hair: Stubborn greys, lackluster colour, coarseness, frizz, unruly hair, dryness and breakage. 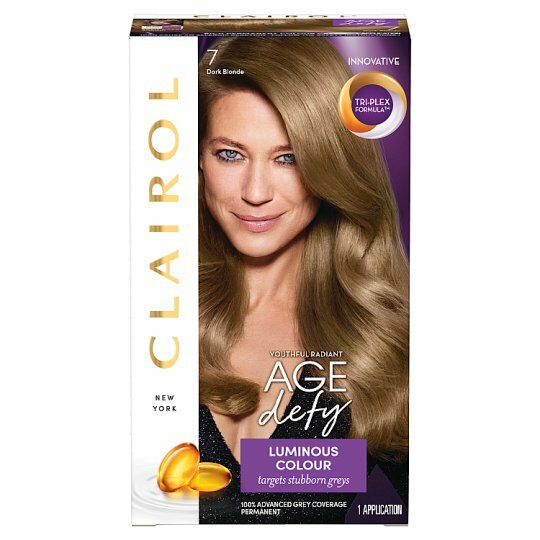 For 100% long lasting grey coverage, Clairol Age Defy 7 Dark Blonde Hair Dye, is the perfect solution to restore your colour. Discover the innovative Tri-Plex Formula, a conditioning technology that delivers strong, coloured hair to help turn back time. With the Age Defy Smoothing Pre-Treatment that softens coarse, resistant grey hair, colour gets in smoothly and our special conditioning therapy helps restore every strand to reveal stunningly soft, smooth, and manageable hair. 1. Apply the Intensifying Pre-Treat Serum  to dry hair. Put on gloves. Pour tube [2a] into bottle [2b] and shake. 2. If you colour every 1-3 months, make 1/2 inch partings through hair and apply mixture on roots from front to back until saturated. Leave for 30 min. Apply remaining mix to rest of hair from roots to tips until saturated. Leave for 5 min. Total application time is 35 minutes. 3. If you haven't dyed in more than 3 months, apply mixture to all of hair for 35 min. 4. When time is up, rinse colour out and apply CC+ ColourSeal™ Conditioning Therapy . Leave on for 2 min. Rinse. Use remaining CC+ ColourSeal™ Conditioning Therapy once a week after shampooing. Important safety warnings: Hair colour products may cause allergic reactions, which in rare cases can be severe. Tattoos may increase the risk of allergy to this product. Conduct a skin allergy test 48 hours prior to each application, even if you have already used colouring products before. Remember to buy the product 48 hours in advance. Do not use this product if you have experienced any reaction to hair colour products or have sensitive, irritated or damaged scalp. In these cases, do not conduct the skin allergy test and consult a doctor before using any hair colour product. Read and follow instructions carefully. In rare cases, use of hair colourants has been associated with temporary or permanent skin depigmentation (skin lightening or loss of colour). If you notice any skin depigmentation or other unexpected reaction such as pain or severe itching, discontinue use immediately. Caution: This product contains ingredients that may cause skin irritation on certain individuals and a preliminary test according to accompanying directions should first be made. This product must not be used for dyeing the eyelashes or eyebrows. To do so may cause blindness. Product not intended to be used on children. Keep out of reach of children.